While the KYL line is a rural and often low speed line, the remote nature of the section means that geotechnical incidents such as rockfalls, soil failures and toppling of trees can result in significant disruption. Fairhurst were commissioned to inspect ten sites over 25km of the line and design cost effective geotechnical solutions to reduce the risk to the line posed by these assets, particularly during periods of intense or prolonged rainfall. In order to provide a cost effective solution within the budgetary constraints of the project, the ten sites were subject to a strategic risk ranking on the basis of initial site walkovers and comments provided in Network Rail cyclical Earthwork Examinations. Detailed inspected and design was initially carried out at those sites which were ranked as ‘higher relative risk’ in order to maximise the improvement in asset resilience. Rope access inspection was used extensively to ensure an accurate record of joint discontinuity and potential hazards was obtained, often proving the potential hazard size to be less than expected and thus allowing for a reduction in remedial works and consequently providing a cost saving to the client. 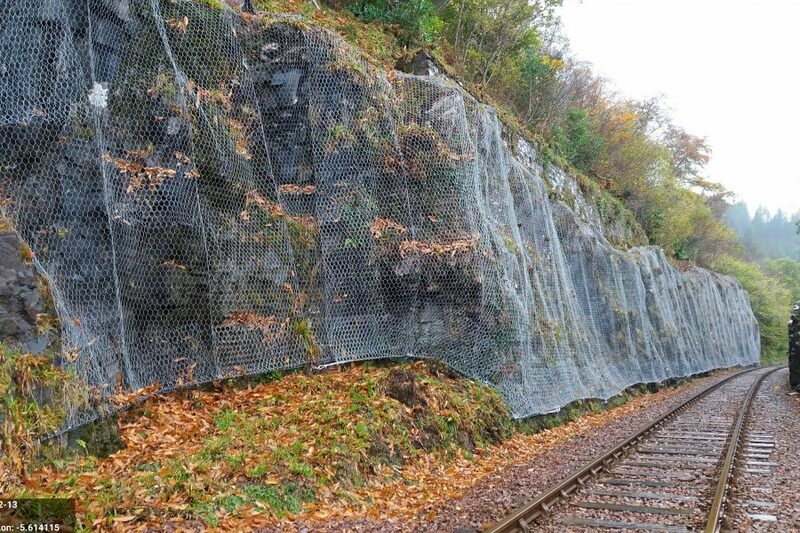 Detailed design included passive draped rockfall netting, targeted rock reinforcement dowels, high tensile netting with pattern dowels, targeted scaling and drainage improvements including the use of concrete cloth-lined ditch to ensure resilience during adverse weather and to reduce frequency of maintenance works.